Home 2016 Could a Loss by ‘Mr. Brexit’ Cause ‘Texit’? Could a Loss by ‘Mr. Brexit’ Cause ‘Texit’? Donald Trump has started calling himself, “Mr. Brexit.” He’s referring to the United Kingdom vote for the “British Exit” from the European Union (EU). That’s because the British polls showed the referendum going down to defeat—by six percent, but it ended up passing. Trump is saying all the American polls—showing him down by six percent—are also wrong, and that he will surprise everyone by winning in November. Pollsters consistently underestimated the Brexit vote, leading to a shock victory for the populist Leave campaigners. In late June, opinion polling showed the Brexit campaign to leave the European Union (EU) down by as much as six points, with analysts claiming this number might even be larger when considering the “Don’t Know” voters and how they would likely break for the Remain campaign. We’ve discussed this elsewhere, but we bring it up here because there’s a new movement in this country: TEXIT. More than 3 in 5 of Donald Trump’s supporters in Texas say they would back secession if Hillary Clinton becomes president, according to a new poll. Sixty-one percent of Texans backing Trump, the Republican presidential nominee, want out of the U.S. if Clinton, the Democratic nominee, wins, according to the Public Policy Polling (PPP) survey released Tuesday. Townhall is not overly surprised. It comes a surprise to no one that in Texas, secession is always a possibility. According to recent poll numbers from Public Policy Polling, three out of five Texans who support Trump said they would rather secede from the United States than stand behind a hypothetical President Hillary Clinton. Texans, along with many southerners, support seceding from America generally. But when Clinton is added to the mix, the majority of [Trump supporting] Texans say they’d rather leave. Clinton is not popular in Texas. The poll shows that Clinton is unpopular in Texas and has a 36/59 favorability rating. Trump maintains a 40 percent favorability rating. Trump voters agree with precautionary warnings that the election is rigged. If Clinton wins, a whopping 71 percent said that it would be because the election was rigged while roughly 40% of Texans overall would feel the same. The Fort Worth Star-Telegram fleshed out the story. • If New York Democrat Hillary Clinton wins nationally, it will be because the election was rigged (71 percent). • If it’s rigged, the blame might go to the progressive group ACORN (the Association of Community Organizations for Reform Now), even though that group went out of business in 2010 (60 percent). • And if Clinton wins, Trump voters and Texas Republicans as a whole say Texas should secede from the U.S. (57 percent) . . .
Trump’s conspiracy-driven claims of stolen elections and secret global alliances are too much for many Republicans, the poll showed. One in 4 Texans who voted for Mitt Romney in 2012 has an unfavorable view of Trump. About 10 percent of Romney’s 4.5 million Texas voters already switched to Clinton. In a social media analysis by North Carolina-based Demographics Pro, Trump followers are four times more likely than Clinton’s to post seriously about a “new world order” or quote 9-11 “truthers.”. . .
Wilson, a scholar on faith-based conservative politics, wrote that claiming “rigged” elections is particularly risky. “Increasingly,” he wrote, we think that everything is “rigged”: “elections, the economy, sporting events, the SAT, the criminal justice system, the college admissions process, etc. Reckless always wins in Texas. The article also suggested an alternative to secession, which would give Texans vastly more voice within the country. Texans have talked about seceding before, or more likely using Texas’ legal option to divide into five states and gain Senate and electoral votes. FiveThirtyEight drew up a map of the suggested new states, named New Texas, Plainland, Trinity, Gulfland, and El Norte. 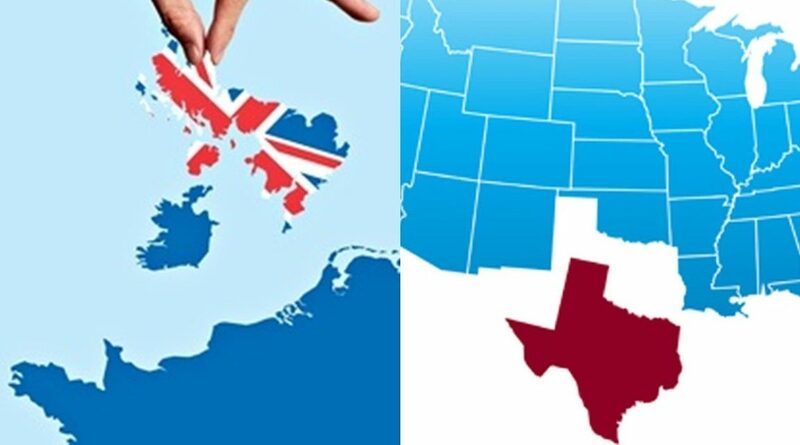 What Texas could choose to do, however, is to divide itself up into as many as five states, a privilege given to it as a condition of its annexation to the Union in 1845. What would Texas look like if it chose to do this? Would dividing a large, red state into five smaller, reddish states benefit Republicans in the Senate? In the Electoral College? . . . This is a map — adapted from the New York Times — of county-by-county results for Texas’ presidential vote in 2008. I have divided Texas into five states along county boundaries, each of these new states would have a somewhat unique set of political and demographic characteristics. . . Most people focused on the shocking story that Texans would want to secede if Clinton wins. (Not all that shocking. Northerners are always talking about moving to Canada, if a Republican wins.) But Matt Vespa found another shocking detail hidden in his publication’s story. Wait–Trump Is Only Ahead By Six Against Clinton…In Texas? . . .
Trump should be worrying about two things especially – the first being his tax returns. Sixty-four percent felt that he should release his tax returns, while only 10 percent considered themselves undecided. That leaves little room for Trump to ensure a comfortable victory in the Lone Star State. . .
Another factor hamstringing Trump is that he isn’t popular in Texas. The silver lining with all of this is that Clinton is in all likelihood going to lose Texas. Texas Monthly said that the state isn’t turning blue anytime soon. I hope so, though this election could change that for the next cycle. All things considered, “Texit” is probably not likely. Is Hillary enough of a turn off to cause Texas to secede? Probably not only Texas, she is vile enough to turn off the whole country. Will the country disintegrate because of the MEGALOMANIA of this phony, untrustworthy CHARLATAN? We can keep the US in one piece and to do that we have to vote in as the next president DONALD TRUMP!!! Don’t redraw the maps yet! The Republican influence in Texas may be the storm before the calm, the chaos and destruction right before we all have to pick up the pieces and build anew. Take the Dallas County Republican Party which is obliterated now, penniless and powerless from the term of a confused Teapartier as Chair. When folks want something new and elect a leader who is not a politician, we discover sometimes that they are not very good at it. As a result, Democrats will pick up a number of offices here this season in the vacuum. The state’s demographics of growing political influence of minorities, women, and young people in Texas, which is solidly Democratic, coupled with the schisms fracturing the Republicans into basically three disparate parties, means Democrats will indeed rule the state at some point, and we’ll be DAMNED if we secede! The full might of the US will crush any aspirations to secede at the bud. For those who are of the mindset that states/nations/territories/colonies who choose to secede from an oppressive power are criminals, and so is such nation they create, remember that the colonies that called themselves the United States seceded. Subsequently, any claim that Texas is a criminal republic for seceding, MUST also acknowledge that the United States is just as equally criminal, because the parent country did not give permission. In my judgement, The United States and Texas had, and has, equal legality for independence. I welcome a peaceful secession of Texas (accompanied with treaties of: peace, mutual cooperation, and trade) no matter who resides the District of Columbia white house. The United States will still be buying Texas oil and manufactured goods. Vehicles with goods and people will openly pass from the U.S. into Texas, and vice versa. It is simply that taxes will not be sent from Texas ti D.C., and the U.S. won’t be sending any benefits or services to Texas citizens. Texas will defend it’s own southern border, its own way, because the entire United States military & border patrol combined, had been incompetent and ineffective in stopping invasions from the south. Texas always talks about seceding when it appears they aren’t getting their way. I lived in TX for 3 months and couldn’t wait to get out of there. They hate the government until it’s time to get their VA benefits, railroad benefits, social security or medicare. In other words, whatever is a benefit for them.